It wasn’t what you normally associate with Mayday. At one time, torrential rain of almost tropical intensity threatened to transform Brands Hatch into a series of lakes as water cascaded into the pit lane and seeped into the garages. 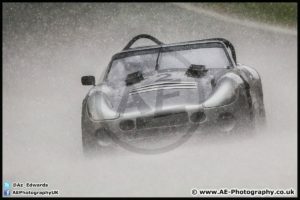 Racing at MSV’s bank holiday meeting was suspended and the Bernie’s Bangers V8 event was red-flagged ten minutes early. But so what? We’d won, or rather Tim Davis had. In fact, Boss Racing customers did rather well that day despite changeable weather which mixed heavy rain with bright sunshine. Jonny Pittard performed very respectably in the pair of All-Comers’ races, while Keith Vaughn Williams was a Bernie’s V8 class winner and Tim particularly distinguished himself by defeating 40 other loud and powerful cars on his first outing on the Grand Prix circuit. On a soggy surface Tim placed his 4.5 litre Tuscan in third place on the starting grid to be at the sharp end of a field which included a Porsche 917K replica, a Ford GT 40, a Shelby Daytona Coupe, sundry other TVRs and a host of very quick MG V8s. When the lights went out he powered ahead of the slipping and snarling, growling and grumbling pack as the cars banged and spat their way around Paddock Hill Bend to start what was intended to be a 45-minute race. As they sorted themselves out Tim quickly slotted into second behind the spectacular stars-and-stripes-liveried V8 Opel Manta. This was in line with his race strategy of letting someone else show him around an unfamiliar circuit for the first few laps of a lengthy race. Tim made his mandatory stop on lap 7 and took the lead on lap 13. He stayed in front, increasing his lead until the rain came down in serious quantities. When the red flag was shown Tim had lapped the whole field bar the second and third-placed cars. He also set the race’s fastest lap. Dean Cook, who has swapped his wicked-looking red TVR Sagaris for a wicked-looking orange Sagaris, had stopped early. Sharing with Darren Dowling, Dean had opted to forego his fifth-place on the grid to run his car on slicks, which meant he started from the back of the grid. Although he moved swiftly up the field he ultimately stopped for good on lap 13 as the rain started in earnest. Like most other competitors, Jonny Pittard had to qualify on a damp track but still placed his Caterham 7 Superlight third on the grid for the first all-comers’ race. He slipped back to finish fifth but was still the leading Caterham driver at the flag. Conditions were looking a little more settled for the second race so we made a late decision to put his car on slicks. We made the change in the assembly area as the cars were waiting to be released on to the grid. Jonny started from the third row and initially seemed to be struggling but as the track surface began to dry he hauled himself up the field to finish a fighting sixth. The day before, while I was giving a mate a hand looking after a clutch of race winning Lotus Elites at the MG Car Club’s two-day Brands meeting, Chris Whiteman was achieving some solid results with his Boss Racing powered Honda Civic Type R.
In the first of two BARC Cannon’s Motor Spares Tin Tops races Chris started from sixth on the grid and, after a tense tussle with the similar car of Daniel Fisher, managed to finish second. Fisher was ahead when the second race was red-flagged after just two laps. Because the 1830hr curfew time was fast approaching the race wasn’t re-started and the results were declared, meaning Chris was placed third.